A CEO’s guide to understanding content marketing. Stop banging on the front door of your customer’s mind …when the side door is wide open! 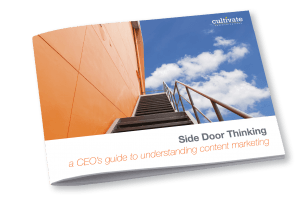 Download our FREE eGuide, Side Door Thinking, to discover the insights you need to take a kinder, gentler — yet more effective — approach to your marketing. Get this FREE eGuide Now. Yes, I want exclusive strategic marketing insights delivered to my email - weekly and monthly.